Granbury is a city and the county seat of Hood County, Texas, United States. As of the 2010 census, the city population was 7,978 and is the principal city of the Granbury Micropolitan Statistical Area. Granbury is located 35 miles (56 km) southwest of Fort Worth, Texas. Founded in 1887, Granbury started as a square and log cabin courthouse. Many of the buildings on the square are now registered historic landmarks, including the Granbury Opera House, which still hosts Broadway productions. The city name originated from the Confederate General Hiram B. Granberry. Some scholars, to explain why the city name is spelled differently, believe the name Granberry was misread on a document, but recent findings have concluded that Granberry chose to spell his name Granbury. Recent expansion of the city was made possible by the damming of the Brazos River in 1969, which formed Lake Granbury, a long, narrow lake which flows through the city. Granbury and Hood County are rich in Texas history. David (Davy) Crockett's wife, Elizabeth, settled in Hood County in 1853 following the Texas Revolution against Mexico. Crockett, as well as other Alamo participants, received 640 acres in land grants. The Crockett family received land in what is now Hood County. Elizabeth Crockett is buried in Acton State Historic Site, the smallest state park in Texas. A large statue of Elizabeth Crockett marks her grave site. Several of Crockett's descendants still reside in Hood County. John Wilkes Booth, according to Granbury legend, moved to Hood County and assumed the name of John St. Helen. A store on the historic town square, St. Helen's, is named after him. On May 15, 2013, a tornado with a preliminary rating of EF4 struck Granbury, leaving six confirmed deaths and at least 100 homes damaged. Approximately 48 injured people were treated at Lake Granbury Medical Center. Granbury is located at 32°26′31″N 97°46′53″W﻿ / ﻿32.44194°N 97.78139°W﻿ / 32.44194; -97.78139 (32.441978, −97.781383). According to the United States Census Bureau, the city has a total area of 13.994 square miles (36.24 km2), of which, 13.386 square miles (34.67 km2) is land and 0.608 square miles (1.57 km2)(4.34%) is water. As of the census of 2010, there were 7,978 people, 3,559 households, and 1,927 families residing in the city. The population density was 619.1 people per square mile (239.0/km²). There were 4,419 housing units at an average density of 342.9 per square mile (132.4/km²). The racial makeup of the city was 93.75% White, 0.71% African American, 0.71% Native American, 1.13% Asian, 0.01% Pacific Islander, 2.11% from other races, and 1.58% from two or more races. Hispanic or Latino people of any race were 8.57% of the population. There were 3,559 households out of which 27.0% had children under the age of 18 living with them, 48.4% were married couples living together, 9.5% had a female householder with no husband present, and 39.0% were non-families. 34.9% of all households were made up of individuals and 18.7% had someone living alone who was 65 years of age or older. The average household size was 2.20 and the average family size was 2.83. In the city, the population was spread out with 21.0% under the age of 18, 8.0% from 18 to 24, 25.6% from 25 to 44, 21.9% from 45 to 64, and 23.4% who were 65 years of age or older. The median age was 42 years. For every 100 females, there were 83.4 males. For every 100 females age 18 and over, there were 77.1 males. The Granbury Independent School District consists of 21 campuses. They include Granbury High School, STARS Academy, Behavior Transition Center (BTC), Granbury Middle School, Acton Middle School, Mambrino Elementary School, Brawner Intermediate, Oak Woods Elementary, Acton Elementary, Nettie Baccus Elementary, and Emma Roberson Elementary. Granbury has been a 5A district since 2008. There is also a Happy Hill Farm Academy home. In 1999, boys' soccer won the 4A state championship in Texas. Granbury is served by Granbury Regional Airport (GDJ). The neighborhood of Pecan Plantation has a municipal airport (PCP). It operates only recreational flights. Granbury and Hood County are part of the Dallas/Fort Worth Television media market in North Central Texas. Local news media outlets are KDFW-TV, KXAS-TV, WFAA-TV, KTVT-TV, KERA-TV, KTXA-TV, KDFI-TV, KDAF-TV, KFWD-TV, and KDTX-TV. Granbury is also served by a local Public Education & Government Access Channel (PEG) Granbury TV. Hood County is serviced by two news media sources, Hood County Free Press, an online daily news publication, and the bi-weekly newspaper Hood County News. Granbury is also served by Tarleton State University's National Public Radio affiliate, KTRL 90.5 FM. The climate in this area is characterized by hot, humid summers and generally mild to cool winters. According to the Köppen Climate Classification system, Granbury has a humid subtropical climate, abbreviated "Cfa" on climate maps. Elizabeth Crockett - Wife of Davy Crockett; Died in 1805 at the age of 72 after a morning walk. ^ "Geographic Names Information System". United States Geological Survey. Retrieved 2008-01-31. ^ "Elizabeth Patton Crockett-Hood County Pioneer"
^ "At Least 6 Dead After ornadoes Rip Through North Texas". ABC News. Retrieved 16 May 2013. ^ "Population and Housing Unit Estimates". Retrieved July 18, 2018. ^ Then Andy met Jo | Hood County News- A twice-weekly newspaper serving Granbury and Hood County, Texas Archived 2018-04-12 at the Wayback Machine Retrieved 2018-04-11. ^ "Smart, tough, and tenacious: The story of Texas's first female county attorney – Texas Bar Blog". Texas Bar Blog. Retrieved 16 September 2015. 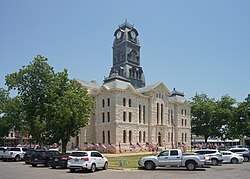 Wikimedia Commons has media related to Granbury, Texas. Wikivoyage has a travel guide for Granbury.